The best preserved dance of death is in the church of Nørre Alslev on the island Falster. The painter is called "Elmelundemesteren", which means that nobody knows his name, but that he also did some famous work in the church of Elmelunde. The picture to the left is taken from a Danish encyclopædia, Lademanns leksikon, and shows king, bishop, nobleman and a peasant with his dung fork. 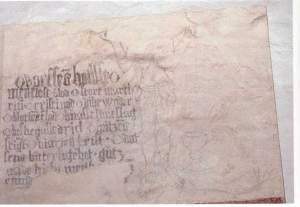 In front of the procession one can see the remains of a figure with two black legs and a trumpet in his hand. Worms and snakes are crawling out of the four corpses but apart from this, Death look suspiciously like a man in yellow clothing, so it's possible that the dance of death has been performed as a play. However there's no proof to support such a theory. Egtved. Click the individual images. In Egtved, in the southern part of Jutland, we find Denmark's longest dance of death. The painting has been protected behind wooden panels since 1600 and this has saved it from a "renovation" of the nave, when the walls were chopped down. Unfortunately all the heads are missing because they protruded out above the panels. This makes it rather difficult to identify the dancers. During the restoration it was decided to pull the painting from the wall, mount it on glass fibre shells and suspend it above the panels. This was done, partly because it's very difficult to preserve frescoes on ground level. The painting measures 10 by 1,5 meter and consists of 10 living and 11 dead men. Many of the participants are very fragmentary, so that you may see a couple of feet here and a corner of a shroud there. The dance is a bit unusual in that it goes from left to right, both concerning the dancers direction and the order of ranks. Thus, the mightiest person, a bishop or pope, is at the rightmost side of the dance. There has probably never been an accompanying text. In Nationalmuseets Arbejdsmark, (= "the work field of the National Museum"), 1971, page 180 it says "The frieze is bordered at the bottom by a red-brown band, the upper border is lost." To the right of the dance there is a prayer and a man of sorrows. 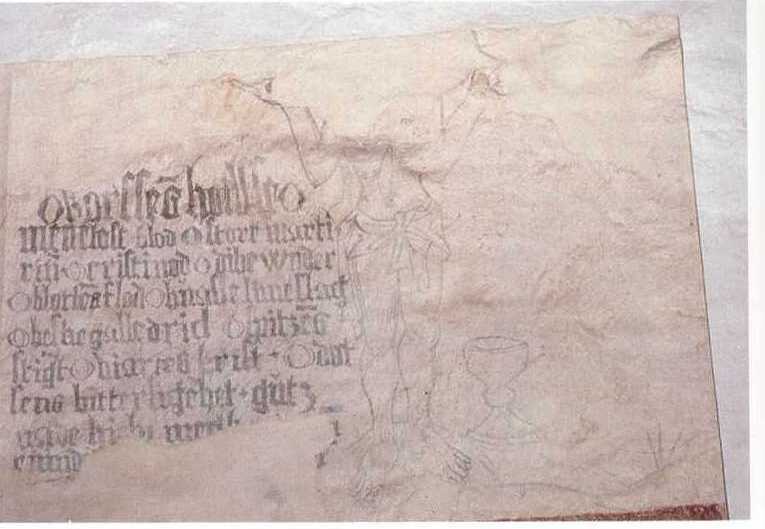 Even though the fresco is not intact, it is possible to read the text by comparing with other prayers like Anna Brade's prayer book from 1497. 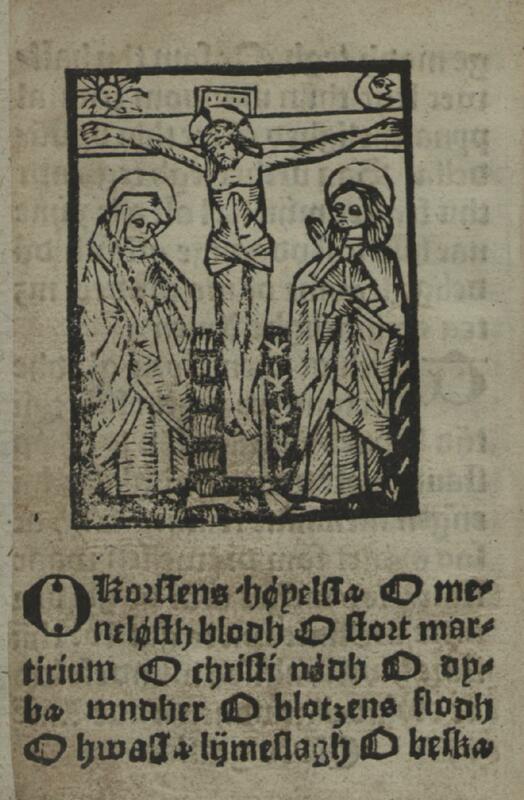 There is also a very similar text in "Nogre gudelige bøner" ("some Godly prayers) from 1509 (picture to the right). 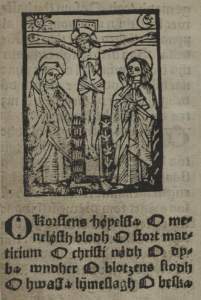 The photos are from "Danske Kalkmalerier", volume 6 pp 166-167.